It’s unclear at this point exactly how down with Father Christmas the four impressive gals of Winterbloom really are. 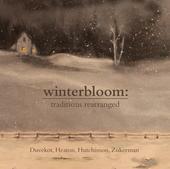 Their evocatively packaged seasonal EP, Traditions Rearranged (the title should be a dead giveaway of what’s to come), features front and back cover paintings (by group member Natalia Zukerman) of sepia-tinted, snow-blanketed country scenes—on the front, off in the distance, beyond the rolling snow banks and a lone, barren tree sits a two-story farmhouse, lights on in the downstairs windows, no humans visible; on the back, a picket fence and what is either the remains of structures long gone or dead foliage. No humans visible there, either. 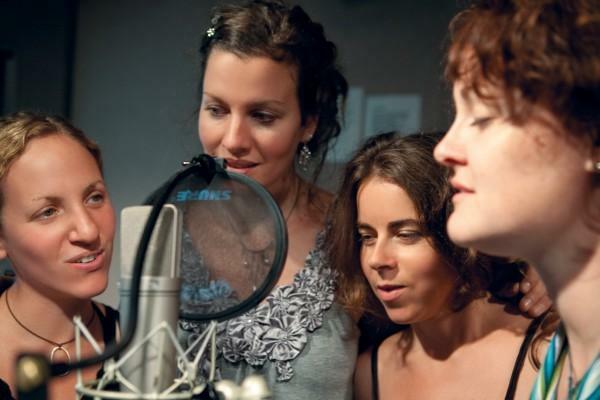 The record opens with a reworking of the old Yiddish folk song, “Tumbalalaika,” titled “The Riddle (Tumbalalaika),” about a man seeking a smart wife by means of shrewd wordplay. Here, however, in a brooding, guitar and vocal treatment, a female voice (that of the aforementioned Ms. Zukerman, in fact) sings of living alone, “with just this riddle nailed to my doors, that says, ‘What grows without the rain?’” among a series of questions posed by the man. She fails, twice, to answer the riddle correctly—“a stone grows without the rain”—and is left, still alone, to ponder her fate. In the Yiddish (and Russian) versions the song has a happy ending—in fact, the girl answers all the riddles promptly and fires one back at the boy—and a celebration ensues, as the lyric “Tumbalalaika, merry we’ll be” indicates. But that lyric isn’t sung here, and instead the song ends with the girl as bereft as she was at the beginning. If you’re beginning to sense our Winterbloom friends evincing a Scrooge-like capacity for putting a damper on others’ good times, you might be right. But stay with them, because things are not always what they seem. Thus is the stage set for an unambiguous Christmas kissoff song, and a bitter one it is in “Thanks For the Roses (Merry Christmas).” Against a jittery guitar rhythm, the sturdy voiced Antje Duvekot, who wrote the song, seethes, “How can I rejoice when you gift was three sizes too small? And when have you ever seen me wear a thong?” So into the joyful chorus we go: “Merry Christmas! Seasons greetings! And a happy new year, and I am leaving/Thanks for the roses, and the Hershey kisses/but the song’s got it right/it’s gonna be a silent night/Merry Christmas!” It doesn’t get any lighter from there, but Natalia Zukerman adding some keening dobro lines infuses the arrangement with a pleasant rustic touch behind Duvekot, and pitches in with Anne Heaton and Meg Hutchinson on some possibly ironic sweet-toned harmonies. Heaton’s contribution to this warm scene is “As You Are,” her jazz-tinged keyboard murmurings supporting her lilting melody, all of it a captivating backdrop for a song about a woman seeing her self-absorbed beau for what he really is after a period of time apart, and it’s not a pretty picture. On the other hand, “Of the Magi,” Hutchinson’s quicksilver ballad based on O. Henry’s “Gift of the Magi,” is sung from the vantagepoint of a broken heart on the mend, looking back and seeing the signs pointing to her romance’s dissolution as she observes lovers cavorting in a park; ultimately she arrives at a bracing acceptance of the good left behind in her own experience: “I stand there and I watch/so much beauty in what’s lost/and what you left me was better than anything you could have bought.” Hutchinson’s falsetto vocal flights echo Joni Mitchell’s technique for expressing the wonder of certain self-revelatory moments, leaving the song’s abrupt ending to suggest chapters yet to come. The cover of Greg Brown’s “Rexroth’s Daughter,” a gently loping country story song about an ill-fated love, doesn’t necessarily fit with the Winterbloom aesthetic here in that it’s a more impersonal and romanticized perspective on matters of the heart than the quartet has shared with us heretofore, but Zukerman’s whispery, understated vocal and tasty lap steel fills lend the performance a striking, mysterious feel that begs repeat listenings to suss it all out. But despite the glee with which the women savage some men who, truth be told, seem to have deserved it, Traditions Rearranged is a work of beauty, passion, intelligence and deep feeling. Some may hear too much Norah Jones influence here, or an overabundance of Joni there, but in the end Mlle. Zukerman, Hutchinson, Duvekot and Heaton have a vision and a voice uniquely theirs, embracing and blending influences from their various cultural backgrounds into a scintillating musical backdrop for their well-considered lyrics, be they ironic, stinging, melancholy or self-affirming. They have a heart, too, and as evident as it is on the abovementioned songs—albeit, in most cases, a bit charred—it announces itself boldy and unequivocally on the three traditional carols included among the eight songs here. Accompanied by Heaton on piano and her own guitar, Hutchinson gets totally immersed in the wondrous event described in “O Holy Night” as she deliberately and respectfully intones the lyrics in a restrained arrangement of stark, commanding allure. She returns with Duvekot (who in fact was born in Heidelberg, Germany) on the penultimate number, a stunning a cappella rendering of “Stille Nacht, Heilige Nacht (Silent Night)” sung in the original German as composed by Franz Xaver Guber and Fr. Joseph Mohr in 1818, a pristine, exalted reading, spiritually profound and imbued with awe and humility, as to brook favorable comparison to the Vienna Boys Choir’s moving interpretation. After that, Heaton sends everyone home on a buoyant note with a solo piano and vocal romp through “Have Yourself a Merry Little Christmas,” a warm, swinging take on the old chestnut made all the more effective by the singer barely reaching the high note she strains for near the end. Traditions Rearranged challenges listeners to work a bit harder for its pleasures than does most seasonal fare, no matter the loveliness of its music or of the singers’ voices, but the reward for digging deeper is an experience more enriching than its modest packaging ever betrays. And about those humans absent from the cover illustrations? Not to worry—they’re here, safe and sound and flourishing with life inside the songs. And keeping Christmas well, every one of them.